Endemic Burkitt lymphoma (eBL) is associated with Epstein-Barr virus (EBV) and Plasmodium falciparum coinfections. Malaria appears to dysregulate immunity that would otherwise control EBV, thereby contributing to eBL etiology. Juxtaposed to human genetic variants associated with protection from malaria, it has been hypothesized that such variants could decrease eBL susceptibility, historically referred to as "the protective hypothesis." Past studies attempting to link sickle cell trait (HbAS), which is known to be protective against malaria, with protection from eBL were contradictory and underpowered. Therefore, using a case-control study design, we examined HbAS frequency in 306 Kenyan children diagnosed with eBL compared to 537 geographically defined and ethnically matched controls. We found 23.8% HbAS for eBL patients, which was not significantly different compared to 27.0% HbAS for controls [odds ratio (OR) = 0.85; 95% confidence interval (CI) 0.61-1.17; p-value = 0.33]. Even though cellular EBV titers, indicative of the number of latently infected B cells, were significantly higher (p-value < 0.0003) in children residing in malaria holoendemic compared to hypoendemic areas, levels were not associated with HbAS genotype. Combined, this suggests that although HbAS protects against severe malaria and hyperparasitemia, it is not associated with viral control or eBL protection. However, based on receiver operating characteristic curves factors that enable the establishment of EBV persistence, in contrast to those involved in EBV lytic reactivation, may have utility as an eBL precursor biomarker. 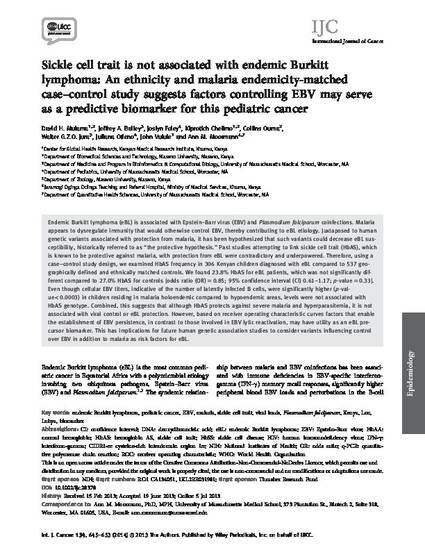 This has implications for future human genetic association studies to consider variants influencing control over EBV in addition to malaria as risk factors for eBL. Copyright 2013 The Authors. Published by Wiley Periodicals, Inc. on behalf of UICC. This is an open access article under the terms of the Creative Commons Attribution-NonCommercial-NoDerivs License, which permits use and distribution in any medium, provided the original work is properly cited, the use is non-commercial and no modifications or adaptations are made.